In Trust Me, I'm Dr. Ozzy, Ozzy Osbourne embraces his status as a medical marvel to tell incredible stories, offer advice as only he can and shed light on his seemingly superhuman ability to stay alive. 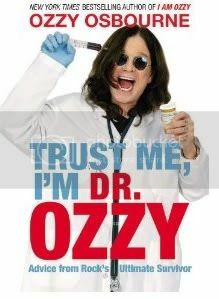 Due out October 11, Trust Me, I'm Dr. Ozzy: Advice From Rock's Ultimate Survivor by Ozzy Osbourne with Chris Ayres (Grand Central Publishing) is the follow-up to 2010's New York Times bestselling memoir I Am Ozzy, which landed at #2 and #3 on the New York Times and Wall Street Journal non-fiction charts, respectively. Based on his ongoing Rolling Stone (US) Sunday Times (UK) columns, Trust Me, I'm Dr. Ozzy will include some of the best material from the columns, as well as survival stories not found in Ozzy's memoir, his answers to celebrities' medical questions, charts and sidebars, and much more. The best way to describe this book is 100% Ozzy - part memoir and part advice column, delivered with Ozzy's famous wit and humor. It's comprised of reader-submitted medical and lifestyle questions, Ozzy digs deep into his murky past, searching for pearls of "wisdom." The genesis of the Dr. Ozzy columns began last year, when Ozzy decided to have his DNA mapped to determine if science could perhaps explain how he survived his nearly four decade avalanche of drugs and alcohol. The Full Ozzy Genome contained variants that scientists had never before encountered. In fact, the findings made headlines around the world and even led to Ozzy hosting a prestigious TED conference. "Wondering if science could explain how he survived his 40-year avalanche of drugs and alcohol, Ozzy Osbourne became one of a handful of people in the world to have his entire DNA mapped in 2010. It was a highly complex, $65,000 process, but the results were conclusive: Ozzy is a genetic anomaly. The Full Ozzy Genome contained variants that scientists had never before encountered and the findings were presented at the prestigious TEDMED Conference in San Diego-making headlines around the world. The procedure was in part sponsored by The Sunday Times of London, which had already caused an international fururoe by appointing Ozzy Osbourne its star health advice columnist. 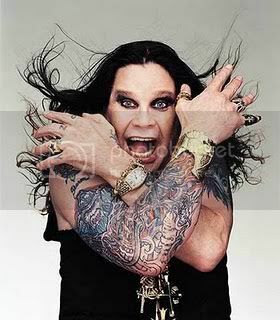 The newpaper argued that Ozzy's mutliple near-death experiences, 40-year history of drug abuse, and extreme hypocondria qualified him more than any other for the job. The column was an overnight hit, being quickly picked up by Rolling Stone to give it a global audience of millions. In Trust Me, I'm Dr. Ozzy, Ozzy answers reader's questions with his outrageous wit and surprising wisdom, digging deep into his past to tell the memoir-style survival stories never published before-and offer guidance that no sane human being should follow. Part humor, part memoir, and part bad advice, Trust Me, I'm Dr. Ozzy will include some of the best material from his published columns, answers to celebrities' medical questions, charts, sidebars, and more."